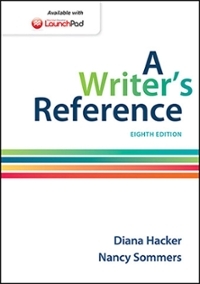 A Writer's Reference 8 Edition For success in college, no skill is more critical than writing; it’s the very core of a student’s academic experience. Tested and trusted, A Writer’s Reference is an essential tool for students who are strengthening habits and skills that will support them throughout college. In an April 2014 survey of first-year writers, 75 percent reported that using a Hacker handbook made them a more confident academic writer. What’s more, A Writer’s Reference has been a powerful tool for change across college campuses—helping to create a culture of writing at many schools by supporting a common language for talking about academic writing. In that way, A Writer’s Reference is uniquely positioned to help transform attitudes about the value of writing instruction and the role that writing plays in academic work and in higher learning. With this eighth edition of the handbook, author Nancy Sommers invites you to be part of a community of those who teach and assign writing; who believe that critical reading, analytical writing, responsible research, and clarity are at the center of effective writing across the academy; and who use the nation’s best-selling and most responsive handbook to support the development of the college writer.LaunchPadLaunchPad combines an interactive e-book with high-quality multimedia content and ready-made assessment options, including LearningCurve adaptive quizzing. Pre-built units are easy to assign or adapt with your own material, such as readings, videos, quizzes, discussion groups, and more. LaunchPad also provides access to a grade book that provides a clear window on performance for your whole class, for individual students, and for individual assignments. The result is superior book specific content in a breakthrough user interface in which power and simplicity go hand in hand. To package LaunchPad free with A Writer's Reference, Eighth Edition, use ISBN 978-1-319-00920-5.